After putting about six months of service into my town's School Wellness Committee (see earlier post), I was quite pleased with the outcome. The local chapter of the children's advocacy group Stand for Children offered the headline: "Nutrition and Wellness SUCCESS!". The hardest part of this work came after the wellness committee completed its draft, calling for a number of important improvements to the nutrition environment, when it became clear we hadn't done enough outreach to principals. What a disappointment! We had made such a disciplined effort to solicit community input and had made tentative efforts to reach principals, and hadn't expected strong opposition from that quarter. The best zinger in opposition to our proposal, really at my expense, came from my son's much respected no-nonsense principal at Thompson Elementary, who feared additional bureaucratic burdens: "The best wellness policy is a good education." Yet, with a good deal more work, we all pulled together and reached a final document (see link here) that required compromises on all sides and yet earned every faction's support. Some of the most important planks give the principals more discretion than the first draft did, which means their commitment to the spirit of this effort will be a critical factor going forward. For me, this experience provided a great education in local politics and was also a rewarding effort, because of the benefit for my children and all the children in the community. You can imagine, in my U.S. Food Policy class this fall, that the lecture and discussion on the "advocacy coalition framework" and other political science theories will be a little less dry. By any health measure, today's children are in crisis. Seventeen percent of American children are overweight, and increasing numbers of children are developing high blood pressure, high cholesterol and Type 2 diabetes, which, until a few years ago, was a condition seen almost only in adults. The obesity rate of adolescents has tripled since 1980 and shows no sign of slowing down. Today's children have the dubious honor of belonging to the first cohort in history that may have a lower life expectancy than their parents. The Centers for Disease Control and Prevention has predicted that 30 to 40 percent of today's children will have diabetes in their lifetimes if current trends continue. The only good news is that as these stark statistics have piled up, so have the resources being spent to improve school food. Throw a dart at a map and you will find a school district scrambling to fill its students with things that are low fat and high fiber. Rates of overweight and obesity have reached epidemic levels in the United States, and no single approach will turn them around. However, the Food Stamp Program (FSP) and Special Supplemental Program for Women, Infants and Children (WIC), which provide broad coverage of high-risk groups, afford potentially effective ways to promote healthier lifestyles that can decrease the prevalence of obesity. Governors have considerable opportunity to curb the health problems caused by excess weight through innovative changes in FSP and WIC coupled with other initiatives with the target populations. Financial and physical access to nutritious foods, in addition to education and guidance on healthy nutrition and lifestyle choices should be core components of increasing the health impact of FSP and WIC. The section on enabling state innovation discusses options for providing extra value for food stamps targeted for healthy food options, waivers for state pilot programs, and improvements in the process of developing state food stamp nutrition education plans. Eileen Kennedy, Bea Rogers, Patrick Racsa, and I contributed to this report. 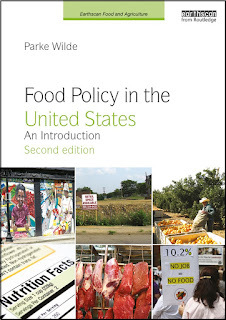 U.S. Food Policy will begin posting again during the week of August 21. Paul Blustein's article in the Washington Post dated tomorrow is charming for several reasons. The oddity of Antigua's trade law case against the United States, over U.S. prosecution of an internet gambling operation, helps to illuminate how trade agreements work. In discussions with critics of trade agreements, I often point out that the agreements threaten U.S. sovereignty less than one might think. The World Trade Organization can't generally enforce penalties in U.S. courts. It can merely permit the plaintiff country to abrogate it's own free trade commitments in response, which seems entirely reasonable. You can see how mild a restriction on sovereignty the WTO ordinarily imposes when you imagine how little it harms the United States if Antigua is permitted to restrict U.S. imports in retaliation. (The Antiguan proposal to start exporting American music and video without paying royalties is a clever twist, however). With droll understatement, Blustein recounts how the Bush administration's first and completely fair-minded reaction was to make clear that all U.S. internet gambling is illegal and hence there is no unfair restraint of trade in prosecuting Antiguan internet gamblers also. After all, the conservative administration is against gambling and other vices anyway, right? The catch is that the leadership in Congress is even more corrupt than it is conservative, and the horse racing industry has convinced powerful legislators not to ban internet gambling on horse races. So, the administration's second and much less noble response is essentially to lie to the WTO about the state of U.S. laws covering internet gambling, in hopes that the world organization would not dare to rule for David while Goliath stands watch. A frequent irritant in international relations is that small, weak countries such as Antigua feel run over by big, rich countries such as the United States. That's especially true in global trade. For instance, developing countries say their destitute farmers get the short end of the stick because of the subsidies and protections that rich governments give their farmers. Just last week, negotiations to redress such grievances collapsed. The WTO, the body that referees global commerce from its offices in Geneva, claims to play equalizer: Its Web site notes that small countries have beaten bigger ones in its trade courts. A win for Antigua would improve the WTO's image of requiring all nations, Davids and Goliaths alike, to follow the rules. With the 2007 Farm Bill approaching, the Environmental Working Group's Ken Cook last month issued a challenge to Rep. Larry Combest (R-TX), to debate the merits of U.S. farm subsidies in a fair and neutral venue. I enjoyed a public debate with Cook last year at the National Food Policy Conference hosted by the Consumer Federation of America, and found him quite reasonable. Surely he won't be any harder on Combest than he was on me! I'm writing to challenge you to a series of public debates about agriculture policy, including the purposes and impacts of farm subsidies, agricultural trade, conservation, rural development and the shape of the next farm bill. You and I have often disagreed on the merits of farm subsidies via the media. Why not debate those differences in person as a way to focus public attention on an area of policy that you passionately defend and I strongly criticize? I was reminded of our disagreements when I read a recent Chicago Tribune article in which you referred to reformers as "the medley of malefactors who are teamed up to bring farm policy down in this country," united by "inverted pentagrams" and "voodoo," and who "need to understand that the real environment—as opposed to the one they are trying to conjure up—is not on their side." I was so struck by your observations that I actually straightened my pentagrams, stored my voodoo pins, and contacted a number of distinguished agricultural journalists and economists who specialize in farm policy to see if they would serve as moderators at one or more of the debates. Without exception, all of them either readily agreed to do so or expressed an interest in pursuing the idea. I am confident we can arrange for any number of institutions to sponsor the debates at agricultural colleges and universities in farm country. We might also request slots in the programs of major state and national farm meetings and conventions this coming year. I propose that we kick off the series here in Washington in September or October at your convenience. Sonja Hillgren, the Senior Vice President/Editorial of Farm Journal, past president of the National Press Club, and one of the country's leading agricultural journalists, has agreed to serve as moderator. Over the past 18 months I've spoken at farm-related gatherings large and small in Minnesota, Kansas, California, Arkansas, Iowa and Oklahoma, so I've experienced firsthand the very strong interest in rural America for an open, rigorous discussion of farm policy. My staff stands ready to schedule debates, in coordination with your office and at your convenience, wherever we can attract farm and ranch audiences. I hope one or more of our early debates outside Washington would take place in Texas. Ideally one of the sessions would take place in your former district. My idea for the format is simple, if it is agreeable to you. Each of us would have 20 minutes to make our case however we see fit. Call it "PowerPoint at 20 paces." We would have a few minutes to respond to one another's presentations, after which a moderator (or moderators) would pose questions of their own, and invite them from the audience, for another 45 minutes or so, with 3-4 minutes for each of us to summarize. We could arrange to debate specific topics beforehand, or leave the debate completely open—again, if this approach would be agreeable to you. Many prospective moderators I contacted, journalists in particular, felt that you would decline my invitation on the grounds that a public debate would elevate EWG's visibility on farm subsidy reform. That rationale seemed implausible to me. After all, EWG has routinely been criticized by defenders of the subsidy status quo precisely because we have been so visible in the farm policy debate—and also, allegedly, misleading and flat-out wrong. Now why wouldn't the former Chairman of the House Agriculture Committee, and the primary architect of the controversial 2002 Farm Bill, take the opportunity to make those points in a public forum, face to face? I certainly hope that I'm right and the cynics are wrong. I look forward to your reply, and to some spirited, thought-provoking debates with you about agricultural policy.